It is very simple. We are trying to prepare them for a successful career in Martial Arts, as much as we are preparing them for a successful life. 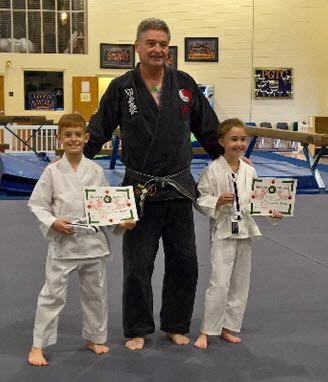 Dragon Level Kids ages 7-12 yr train, grow and mature under kind and respectful instruction. Fun and fitness become a way of life as they learn to set goals and work to attain them, a skill that reaches outside the “kwoon” or school. We often hear parents tell us that our Kids Kung Fu program is the only thing their child has ever “stuck with”. They often say that organized sports or other activities never held the child’s interest for very long. However, these same kids end up spending years with us and reinvent themselves as highly skilled, highly confident, people that never says “can’t” or allows them self to quit something important.